Lauren Centrowitz is training for the 2012 Olympic Trials. Three days a week for the last three years they’ve met to train on the track, father and daughter by blood, coach and athlete by choosing. Yet each has persevered, and in many ways they’ve grown closer. As Lauren’s push to qualify for the Olympics in the 1,500 meters enters its home stretch, each views their shared journey as enlightening. Like her brother Matthew, also an Olympic contender, and her father, an All-American during his college days at the University of Oregon who qualified for the 1980 summer games, Lauren feels at ease when her legs are in motion. 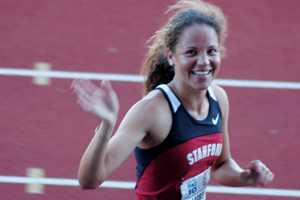 A five-time All-American at Stanford, where she earned a bachelor’s degree in political science, Lauren was a member of the national record setting 4-by-1,500 meter relay team. She also helped the Cardinal cross country team to three NCAA titles. When she decided to set her sights on London in 2012, she enrolled at AU, became an assistant coach on the track team, and implemented a daily training regime that includes three days on the track with her father, three days of eight-mile “recovery” runs, and a Sunday long run of 13 miles. Lauren deems her Olympic chances a “long shot.” She figures she’ll have to lower her time by about 10 seconds — a significant amount in world-class middle distance running — to around four minutes flat. Only the top three of the 30 women who run in the trials will qualify for the Olympics. Win or lose, she’ll reevaluate her career after the summer. She hopes to land a job working for women’s rights, although an attempt to qualify for the 2016 Olympics isn’t out of the question. Women’s middle and long distance runners peak in their late 20s or early 30s, she said. Coaching, however, isn’t this Centrowitz’s future. “I’ve always been invested in the AU team,” she said. “It’s been fun being on the staff. I care about how they do and I’m there for them, even if it’s just having someone understand why dad is yelling at them. My dad has a big personality. All that’s left now is to run the perfect race.